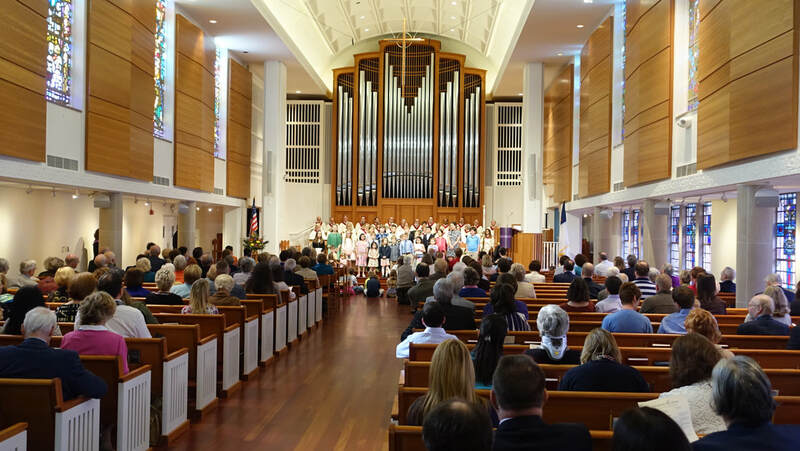 First Presbyterian Church offers three worship services throughout the week. Sunday, 8:30am Service – This service is offered every Sunday and includes Holy Communion. Sunday, 10am Service – This service includes children and youth at the beginning of each service and and Holy Communion is celebrated on the first Sunday of every month. Following the children’s sermon, children will go to their classrooms for church school. Approximately once a month a family worship service includes children and youth for the whole service. For questions regarding our church school classes for children, please see the youth ministries and children's ministries pages. Our Nursery which is staffed by our highly trained and caring child care workers is available for this service. Rejoicing Spirits, Sunday, 5pm Services – On the 2nd and 4th Sundays of every month beginning at 5pm, (May is the 3rd Sunday and June, July and August are only on the 4th Sunday) our no-shush Rejoicing Spirits service is a family friendly service where the gifts of all God's people are affirmed and appreciated. Noise reduction headphones, musical instruments for all, gluten-free refreshments, and a sign language interpreter are available at each service. Stay for a simple dinner and fellowship following the service. Make your reservation for the dinner by signing up online or by calling Cindy Merten at 248-644-2087 x145. For directions to our church please click here (opens in a new window).